Initially, I imagined a timeline - there was this part of my life that was now closed. 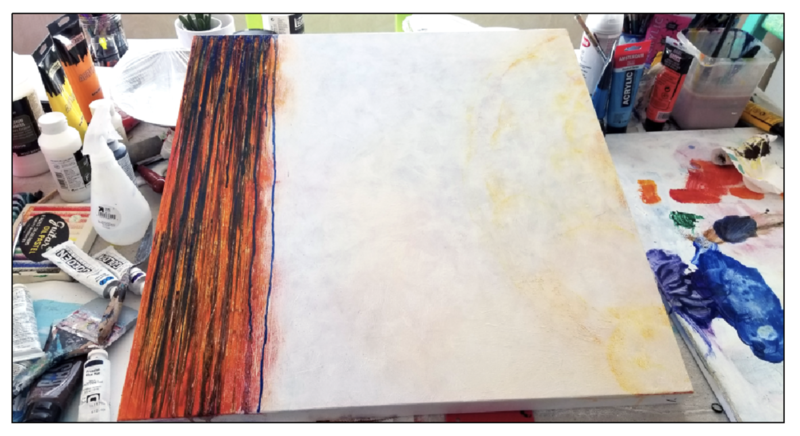 So I painted over a painting that was not going to be completed and then worked vertically, anticipating a left to right movement. There had been much good in that friendship, so I chose bright, warm colors. I made a big shape on the right, but then painted over it - it felt like I was trying to pin down the future, when I need to let the unknown be the unknown. There was also grieving to do, so I dripped darker colors down the left side and watched as they made their way down the canvas. They wept for me. It was tempting to cover the left side with one big angry color, to hide the pain. Instead I decided to let the warmth peek through, since there was still good there. It all remains a part of who I am. i am learning to walk with loss. In time, the grief felt less sharp, so I changed the color of the tears to white. Still tears, but gentler. It was healing to watch them drip their way to the bottom. Then I decided to rotate the canvas, and it looked like solid ground at the bottom of the painting, which I liked. I composed these words of gratitude and goodbye next, and wrote them sideways in green on what was now looking like land after a fire. Today you become the rich soil I give thanks for. Though I will no longer live in your ground, I have received much by your hand and recognize the gifts from this season I would take with me into whatever is next. Vaya con Dios. I wet my fingers and swept parts of the letterforms further up. I added just a bit of blue sky. It's there, but it's far away. I wrestled with wanting to do something with that space in the middle. The colors of the former painting were faintly showing through, and the more I reflected, the more it began to look like heavy fog obscuring something behind. It's that mystery - a place somewhere between what I do (green shoots coming up after the fire) and the activity of God. I am reaching up into the mystery, not to get through it to get to the blue sky, but because mystery itself is worth exploring. I also thought about how the blue sky and the ground are like bookends, holding the mystery. I've left the tension unresolved because mystery is its own place and I do not know what lies ahead.